Seger Horns started its journey in 1981 in Turkey. Today, it is the largest retailer of horns not just across Turkey, but also the world. Seger Horns are exported to 65 countries across the globe and they provide their horns to many of the renowned car manufacturing companies such as Renault, Isuzu, Audi, Honda, Mercedes-Benz, Volkswagen, Tesla, Nissan, Ford and many more. This impressive list of clients is proof of the quality of the horns manufactured by Seger and why they are regarded the best in the world. We offer you the opportunity to shop online for the best quality Seger Horns for cars at EAUTO.pk so that your car can have its own unique voice on the road. There are hundreds, if not thousands, of cars on the road all the time and if you want to set your car apart from the rest then you need to make your car look and sound as unique as possible. That is where Seger horns come in which provide the best horns for cars all over the world. 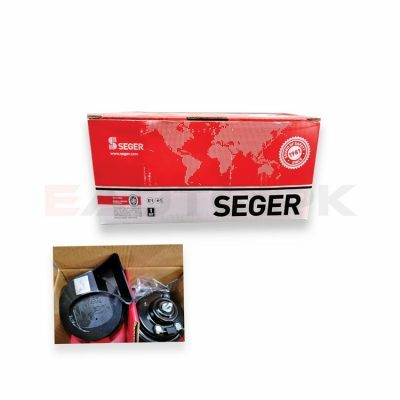 If you want a car horn that demands attention and lasts longer as well, then Seger horns are the best option. Seger offers a wide range of horns with not only different sounds but different pitches as well. They manufacture electromagnetic horns with high and low tone that also have environmental friendly decibel adjustments, so that you can make your presence known on the road without causing discomfort for everyone around you. Or you could opt for Disc Horns that can be fitted to any vehicle whether commercial or otherwise. All kinds of Seger horns are available at EAUTO.pk at the best prices in Pakistan. All you have to do is search for them through our category options or by using the “Search by Brand” option that makes finding car accessories and auto parts easier and more convenient. So hurry up and order the best quality Seger Horn today!